“It started as an opportunity for women to go sailing with other women, and the idea was to take away the dynamic of guys pretending to be in charge,” said SHYC Fleet Captain Chris Sinnett, a retired Coast Guard captain and former commanding officer of the Coast Guard’s Barque Eagle. Sinnett’s wife, Kathy Sinnett, a lifelong sailor, was approached shortly after the couple joined the club and asked to establish a program to get more women out on the water and in sailboats. She did. Since 2012, on Thursday evenings from May to September, women show up at 5:00pm to sail the club’s Ideal 18s in Stonington Harbor. At about 6:30, they return to the dock and clubhouse, where they have cocktails, dinner, and lively conversation with each other and any family members or guests who join for dinner. On days when the weather is too inclement for sailing, the Ideal Women will gather by the clubhouse fireplace to tie knots and drink wine. This past summer, 50 Ideal Women participated in the program. Of that number, 40% were women new to the club or to the women’s sailing program. Thirteen were guests, three of whom have joined the club or are considering membership. Over the season, 20 qualified women skippers participated, and three additional women were qualified to skipper the Ideal 18s throughout the season. When the women’s sailing program started, the goal of organizers was to promote sailing and on-the-water social activities for SHYC women. The intention was to increase the comfort level, sailing, and seamanship skills of the participants in a supportive and social manner. Each week the crews change, with one advanced, one intermediate, and one new sailor sharing an Ideal 18. By changing up the crews week after week, the women meet other participants and learn different skills from the various skippers. 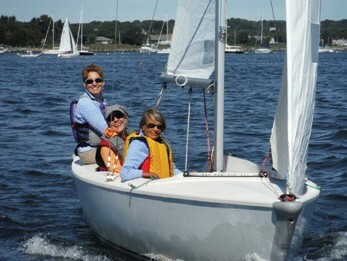 Indeed, the Stonington Harbor Yacht Club’s women’s sailing program has succeeded. It’s so popular that there’s discussion now about starting a similar group for men. In fact, the success of the Ideal Women has inspired more family sailing and on-the-water activities at SHYC. With its fleet of six Ideal 18 keelboats, five Optimists, and one 420, recreational sailing is high on the agenda at the club. For instance, this past summer, the club revived its youth sailing program to get young children involved. Another new program is Monday night family sail. This program was modeled on the women’s sailing program and involves children from kindergarten to high school sailing with parents or guardians and returning to the club afterwards for a barbecue on the patio. The club also initiated an Introductory Guest Sailing Program last summer, which allowed visitors to participate in Club sailing programs and use of the clubhouse for as short as a week or as long as six weeks, for one season only. Part of the appeal of the Guest Sailing Program is that participants can take part in all of the club’s recreational sailing and racing programs, including the women’s sailing program. “One thing I can say about sailing is that it doesn’t happen without some help,” said Chris Sinnett. “People wonder, ‘How do I get out there? How do I reserve boats?’ So learning to sail is just one part. The other part is showing it is logistically easy to do.” The youth, family, guest, and Ideal Women programs all introduce members to the club’s fleet, and how to access the boats, whether as part of a program or on their own once they qualify. Tucker Bragdon, a sailor since the late 1960s and the club’s former Fleet Captain, partners with Chris on Thursday nights to get women out to the Ideal 18s and answer any questions they have. But the decision-making, he said, is left up to the women. “They might ask us a question, but what happens is determined by the women themselves,” said Bragdon. And that’s a good thing for sailing, which has seen a decline in participation since its glory days in the 1970s and ‘80s. As the industry and advocates work to reverse that trend, they give a nod of appreciation to programs like SHYC’s Ideal Women. SHYC Vice Commodore Betsy Bowman, an active sailor, noted that the number of women participating in Stonington is the envy of other clubs up and down the Sound. And the Stonington Ideal Women have reached out to the ladies at Essex Yacht Club in Essex, who they race against once each year, to brainstorm ideas to get more women and clubs participating. But the Ideal Women do not just sail and dine. They fully participate in the club’s many year-round activities both on and off the water, crew with their friends and families in club-sponsored races, and join other club members on SHYC’s extensive summer cruising schedule. They are also mainstays in the on-the-water race committee support team from SHYC for the annual Special Olympics Fall Games State Regatta, sailed in Stonington Harbor annually. 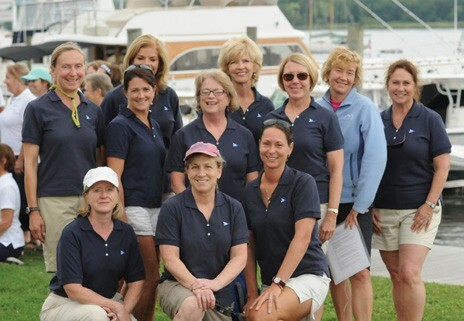 To learn more about the Ideal Women, visit Stonington Harbor Yacht Club Ladies Sailing. Ann Baldelli is a longtime reporter at The Day, a daily newspaper in New London, CT. She makes her home in Stonington, where she is a member of the Stonington Harbor Yacht Club. While she enjoys sailing, she spends more time on the water in small powerboats.